A marathon doesn’t usually start in a pub. But that’s sometimes where they begin, years before the inaugural bang of the starting gun. Brighton began because two locals used their expertise to spot a gap in the running market. Tim Hutchings was a former GB runner with medals for 5000m at the European Championship and Commonwealth Games. He’s also a Eurosport commentator and had worked as the London Marathon’s International Coordinator for 10 years. Tom Naylor is Brighton born and bred, the son of parents who had long been active in local running events. They used to organise Brighton’s half marathon. His mum, Chris, is the current President of the city’s Arena 80 athletics club. The Moyleman, in contrast, began as a less ambitious concept but has still grown to the immense satisfation of the local mates who thought it would be a fun thing to do. It’s named after Chris Moyle, a local runner who died from stomach cancer in 2009. The spot where his ashes are scattered looks down on part of the route. Its real genesis came, however, when Duncan Rawson, a keen mountain biker, met Ash Head, Moyle’s training buddy, in a pub, and enthused about his day spent riding a punishing lap around the local hills. He said he’d covered about 28 miles, which switched on a lightbulb. Head wrote a blog outlining a speculative marathon route, saying: “This’ll probably never happen.” The reply came back from another friend and local runner, Tom Roper: “This MUST happen.” Rawson and Head now share the job of race director, while Roper is chief marshall. Two more friends, Rob Read and Brian Courage, handle PR and money stuff respectively. No one spends so much time on the organising that it ruins the experience, though Rawson still replies to every querying email personally, so the immediate run-up gets hectic. The Moyleman doesn’t require any road closures, and finishes in the deliveries yard of the helpful local brewer, Harveys. Instead of a medal, you get a branded pint glass, complete with beer, at the finish. The only piece of private land used requires verbal permission from a friendly local farmer, who they treat to dinner in a nice restaurant once a year. Naylor’s and Hutchings’ company, Grounded Events, has eight employees who work on the Marathon all year round. But as race day approaches, that number ramps up considerably. They bring in 25 events professionals who have worked on big occasions such as the Olympics and the Tour de France, supervising a 200-strong events team. There’ll be about 500 stewards and security people across the event, as well as 150 medical volunteers – doctors and senior nurses – and 400 St John Ambulance first aiders. Plus about 1800 volunteers handing out race packs beforehand and managing drinks stations during the race. Their race was popular straight away, attracting about 7,500 runners in its first year. Like Edinburgh, whose marathon had just over 6,000 finishers last year, it’s an attractive city to visit for a weekend anyway so has instant appeal. Brighton’s immediate success was also helped by the cunning decision to take place the week before London, hoovering up many who want to train through the winter and didn’t get into the big one. 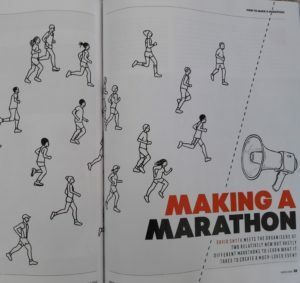 So putting on a marathon is an evolving process – they’re still tinkering. The Moyleman organisers now have to put up their route arrows at the last minute in one village, otherwise they get taken down again by hostile locals. Brighton is experimenting with a start time 45 minutes later this year, to make it easier for participants who don’t live in the city. While they fiddle with this, as well as a slight route alteration and changes to the park and ride system, they’ve made the number of entrants a bit lower. Yet both sets of organisers know that they’ve created something valuable, loved by many who come repeatedly, and have no desire to make their races much bigger or smaller. “Someone suggested a while back that we could make this the Sainsbury’s Moyleman. Over my dead body,” says Head. 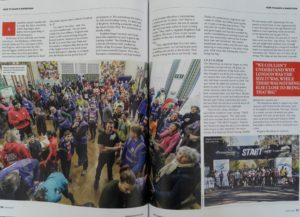 Through their backgrounds as high level runners and Tom Naylor’s experience running a small business, Brighton’s organisers already knew plenty of the key people to speak to about putting on a local marathon. Moyleman organiser Duncan Rawson’s background in farming got him access to the right fields. It can take a few years for that initial pub idea to become a reality. The first conversation about a Brighton Marathon took place in July 2007 and it was licensed in May 2009. An unofficial Moyleman for 15 running friends took place the year before they did it for real. One of Brighton’s biggest problems was the year that the kit bags turned out to be too small and flimsy. Unfortunately they only discovered this when thousands of them arrived two days before the race. Needless to say it didn’t happen again. As a small race relying largely on local goodwill, the Moyleman can cut it fine to be completely ready. Marshalls often only emerge at the last minute, or have to be ferried from early in the race to near the end to man a second post. One year, in the absence of anyone else, a medic crew took over a water station for a while. Without the investment of numerous charities, who receive their money back fivefold when people receive their allocated places and do sponsored runs, Brighton would struggle to operate. Although it doesn’t have any offcial charity involvement, the Moyleman gives any profits to Martlets, the local hospice that cared for the race’s namesake. As R Kelly sang in Bump ‘n’ Grind, the R&B superstar’s famous song about cross country running, “My mind is tellin’ me no, but my body, my body’s tellin’ me YES!” We can receive conflicting messages when racing, and it’s hard to know what to believe. Most confusingly, how can we tell that we’re trying as hard as we can when we run? If you cross the finish line and are able to chat straight away, or indeed feel comfortable enough to natter during a race, you could probably give a little more. The problem is that we don’t usually recognise that until late on. If you can summon a blazing sprint finish at the close (and most of us can – that’s the best bit, isn’t it? ), who’s to say that you couldn’t have used that extra energy more effectively in the rest of the race? You can’t win a top level race without trying your hardest though, surely, so how do the big boys do it? I ask triathlon gold medallist Alistair Brownlee who, as a less than ideal interview mix of single-minded professional athlete and Yorkshireman, doesn’t have much to offer in the way of deep psychological insights. It makes sense that a good way to understand your effort level is to have done something before. When you do it better the second time, you have measurable proof that you’re trying harder. Plus, as we know, having a goal to beat is a great motivator. You’ll have noticed both Brownlee and Lightfoot thinking about their races only in small increments. If you tried to comprehend the magnitude of, say, the Marathon des Sables and its endless stages all at once, you’d run screaming in the opposite direction. But putting one foot in front of the other, then doing it again, and again, ought always to be something you can manage. In practice you can persuade your brain to think positively about repeating these small achievements, according to Andy Lane, Professor of Sport and Learning at the University of Wolverhampton. It’s interval training that will teach you how to push harder for longer. A problem that we face is that we almost always feel that we are trying our hardest, even if the reality is that we could try harder. Matt Fitzgerald cites a study in which cyclists completed a time trial, then did it again racing against an avatar on a computer screen that was programmed to do it two per cent faster than each cyclist had done it previously. The cyclists did better the second time, but on both occasions reported that they’d been trying as hard as they could. So what you’re trying to do is increase your maximum tolerance for perceived effort. 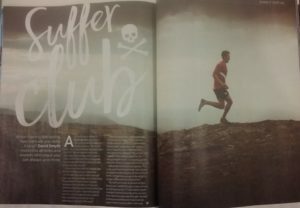 “When you complete a hard workout or race and realise that it didn’t kill you, you feel comfortable pushing a little harder in the next one,” says Fitzgerald. But how do we measure that effort during a race? An attempt to run at a certain pace per mile can come unstuck when there are hills or a headwind. Using a heart rate monitor can teach you the top level at which you can work, and help you to know the line to keep just underneath. However, they can lag, continuing to climb after you’ve already reached the top of a hill, for example. Some devices, such as those made by Stryd and RPM2, can now offer a power reading in watts, of the kind used by cyclists. It could be a more accurate way to keep track of physical effort regardless of hills, wind or technical trails. 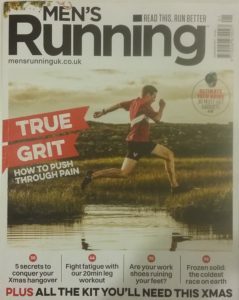 Your best chance of achieving running nirvana or going completely bonkers. Run 3,100 miles (you read that right) over 52 summer days around a single block in Queens, New York: 164th Place to Abigail Adams (84th) Avenue to 168th Street to Grand Central Parkway. If, on your regular runs, you find yourself thinking: “I wish I had more sand in my socks,” why not go for the big one? Over six days, masochistic runners cross 156 miles of the Sahara Desert. An island-to-island “swimrun” near Stockholm, competitors must cross 24 islands, running a total of 40 miles across them and swimming just over six miles between them. Pippa Middleton did it in 2015, so how hard can it be? Mid-July in California’s Death Valley is a fine place for lizards and cacti, but less so for runners. Nevertheless, people keep attempting this 135 mile course in temperatures of up to 54C. “I’m always trying to win, and giving up is like losing. Being mentally strong and trying to carry on to the finish is probably my way of winning,” says Ricky Lightfoot. That’s the ability to stay focused on the thing that you want most, even when confronted with two incompatible things, such as A: wanting to finish quickly, and B: not wanting to suffer. You know for sure that you’re trying harder if you do the same thing again, and do it better. You’re more likely to try harder if you perceive your extra effort as worthwhile. 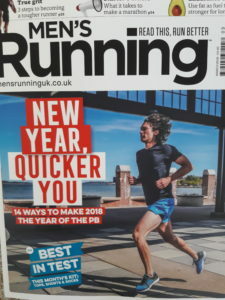 So go for that PB, or that good position.